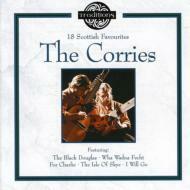 The Corries, comprising Roy Williamson and Ronnie Browne, offered the world an authentic taste of traditional Scottish music. Their name stems from the Scottish term corrie, meaning a circular hollow found in Highland mountains, and is thus evocative of their quintessentially Scottish sound. These were two performers of great skill and charisma, who gained a loyal following for their genuine musicality and appealing stage presence. Their act was always peppered with humor and warmth; Abigail (track 13) and Maids When You're Young (track 15) offer wonderful examples of their capacity for hilarity. This disc brings together some of The Corries' finest songs, and it is impressive that throughout the collection such a rich array of textures is achieved by just two musicians.